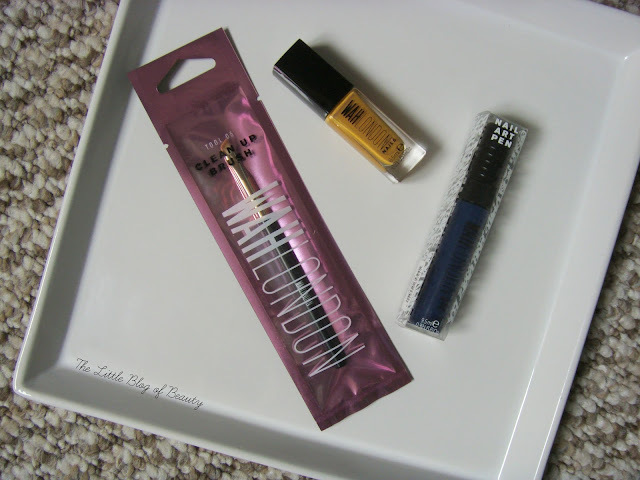 If you're a Birchbox subscriber then you'll know that the May box featured a 'pick your sample' from WAH Nails with a choice of a full size nail varnish, nail art pen or press on nails. I received the press on nails in my sample box and I'm looking forward to giving them a try when I head home this week. A few weeks ago an email landed in my inbox from Birchbox looking for people who were interested in creating a nail art design for Birchbox using some WAH Nails products. Being a nail art blogger of course I applied and I was lucky enough to be picked for the challenge and was sent a nail varnish in Dry Throat*, nail art pen in shade 09* and the clean up brush*. When I first saw Dry Throat I was a little disappointed as yellow nail varnishes rarely suit me and usually leave my hands looking as if I'm suffering from some kind of illness. However I was surprised to find that the mustard shade actually works quite well on me and dare I say it I think I might actually even like it a little. Although it may not be the most original idea the first thing that came to mind when I saw Dry Throat was (big) cat prints, so that's what I went for, with a little twist. The WAH Nails varnish bottles are a little unusual in that they're longer and thinner than most nail varnish bottles. This doesn't make much difference really but you do have to be a little more careful that you don't knock it over as it has a smaller base area to sit on. The brush itself is quite wide and flat but I did have to hold the lid slightly at an angle, holding on to the edges of the top rather than the sides, which did make application a little more difficult than it could have been. That might just be my one though. 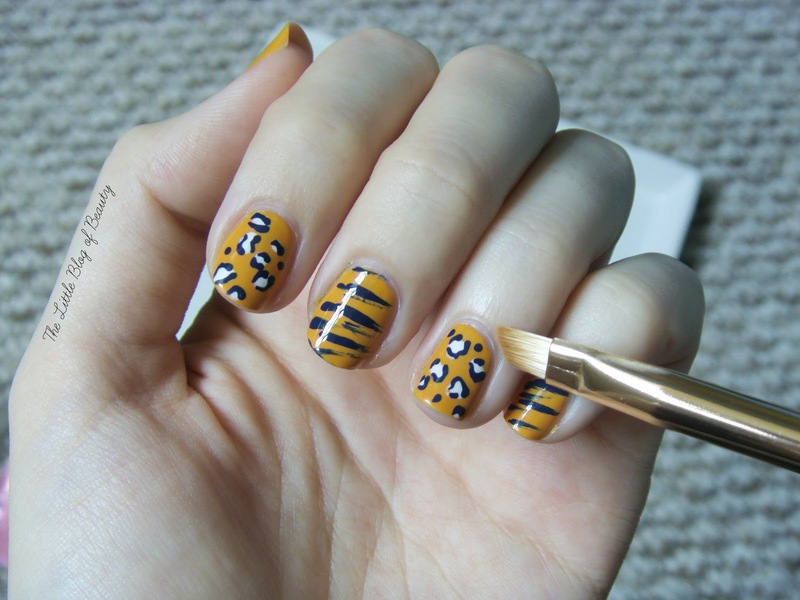 The nail art pen is pretty standard with both a brush and a nib included. The first time I used a nail art pen I had no idea it came with both applicators so if you are new to them you pull the top of the lid off for the nib and unscrew the whole lid for the brush. I used both methods for this nail art and I thought both worked well. Sometimes the nibs on nail art pens can be a little dodgy and a bit leaky but so far I like the flow on this one as it feels like I have quite a lot of control. The clean up brush is rather like a makeup brush, probably closest to an eye liner brush, but the idea is you dip this in some nail varnish remover and use it to brush on the skin around your nails to remove any stray nail varnish. For the nail art design I started with a base coat and then applied a couple of coats of Dry Throat for the base colour or 'cat fur'. To begin with I then went with black 'blobs' for the leopard print, but I then realised the navy blue of the nail art pen wouldn't show against the black. So I started again and went for white blobs instead. I then used the nib of the nail art pen to draw around the edges of the blobs and added a few navy blue blobs to complete the leopard print nails. 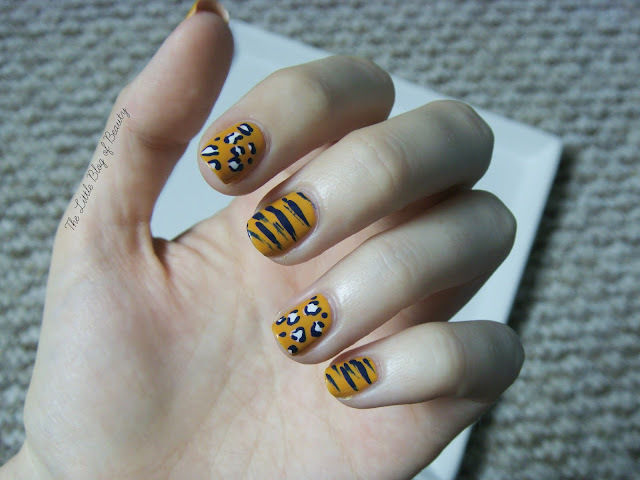 For the tiger nails I used the nail art brush. I wiped the brush against the edge of the tube until most of the nail varnish had been removed and then just swiped the brush repeatedly across the nail letting the brush get 'drier' to give the sparse effect you can see in places. I then tidied around those nails using the clean up brush and sealed all of my nails with a top coat. 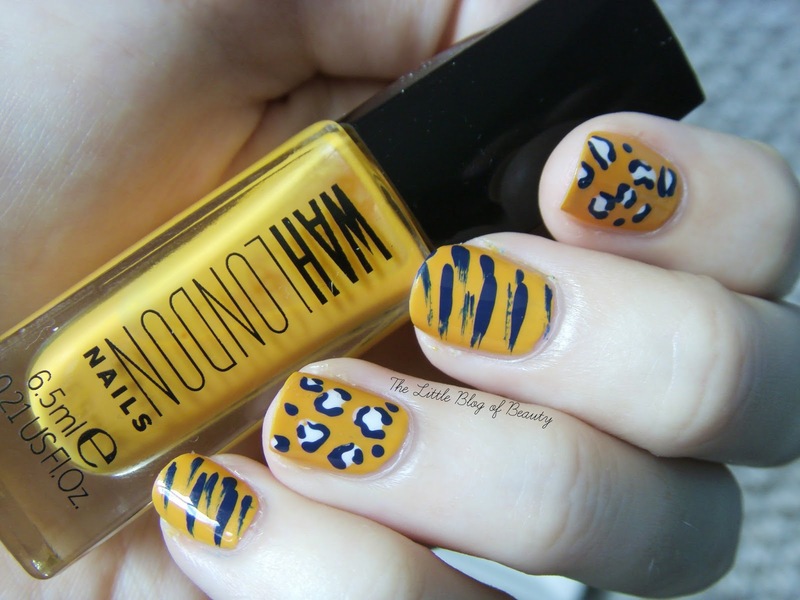 What do you think of mixed cat print nails?